Give the one chosen as "Best Costume" at this year's Halloween party a prize that they will display proudly. Plastic, gold colored trophy with a beheaded skeleton figure holding the head in it's hands. Black plastic base with metallic gold colored sticker that reads "Best Costume." Arrives in a clear plastic container for safekeeping. 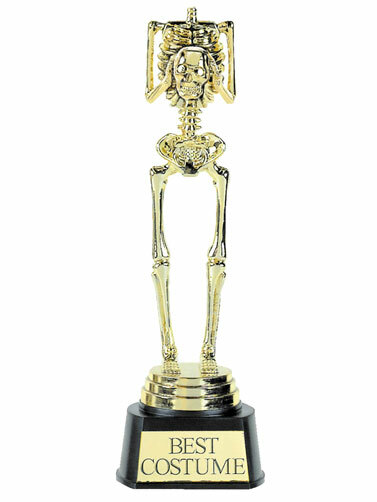 Best Costume Skeleton Trophy measures 9.5"H x 3"W.